My Dad is A Farmworker. He recently retired and wanted to get back to the land. He grew up in a tiny village in The Republic of Macedonia whose main thoroughfare is still a cobblestone street. The smaller roads are all well worn dirt. His family farmed everything for the household - grapes, wheat, corn, vegetables. A diverse array of fruit and nut trees lined the property and just beyond were the grazing fields for cattle and sheep. The sows hung out in the barn and the flock of chickens roamed the home garden. While sustenance was a daily responsibility, their income came from apples. My grandfather was one of the first in his village to plant apple trees in the 1930s upon his return to Macedonia from the U.S. (he never wanted to leave the U.S., though that is another story for another installment.) He planted the larger apple orchard in the 1950s with varieties like Jonagold, Golden Delicious and Red Delicious that seem like heirlooms now with the diverse array of new apple options continually being engineered. Every winter after harvest my Dedo (grandfather) would travel to the Yugoslavian capital at the time in Belgrade, bunk up with buddies and sell his fruit in the open green markets. Apples have an extraordinary shelf life in cold conditions. They hold on until early spring before they start to get mealy and are sold off in bulk cheaply for juice. Starting in the fall of 1998 I spent a year in Macedonia on a Fulbright Scholarship studying ethnic issues in the country and had the luxury of spending an apple harvest with my family. Everyday we would climb apple trees, gently twist the apples off of their branches and carefully place them in cloth sacks slung over our shoulders until we were too lopsided to balance. When we got sassy we crisscrossed bags over our torsos to make fewer trips to the tractor, though it certainly made walking more cumbersome. I ate more apples that fall than I had in my entire lifetime under the golden autumn sun for breakfast, lunch and dinner. The whole experience was delicious – the fatigue, the camaraderie and the stories, side by side with my uncle and two cousins. My parents moved to the U.S. in the late 1960s and while they were successful with small businesses working excruciatingly long hours every day, they have lived in this middle zone between two worlds – the one they left at age 18 and the one they can’t quite seem to get under the skin of 48 years later. They became U.S. citizens in the late 1980s – I remember the day – my mom was wearing this beautiful shiny red lipstick that glowed against her vibrant olive skin, in gorgeous contrast with her blue and white calf-length checkered dress cinched at the waist with short puffy sleeves. Her curly auburn hair was shaped in a fashionable bob-cut and she wore dark blue open-toed shoes with red nail polish. She clutched a leather bag as she kissed us goodbye and drove downtown to recite her oath. They never did move back to Macedonia as they originally planned when they were young kids making their way in Detroit. A house in the suburbs, kids in school, roaming the country and traveling the world. They gave us an extraordinary life, made us work hard, sparingly giving out compliments and showering us in love. And they are still doing this today. Which is why my dad is a farmworker. My family moved to California from Michigan two years ago and my dad was bored to tears. He can only plant so many gardens. He spends hours tenderly watering each plant. One day he wandered over to the Hispanic families down the block from the tasting room in Los Alamos as they were barbecuing outside, drinking cold beers and listening to music blasting out of a truck stereo. He doesn’t speak a lick of Spanish though he felt more at home there than he had since moving to town. He came back with a stack of tin foil wrapped ribs and a job. He was to start the next day. The next morning the ranch foreman picked him up at 5:30 am and drove up Cat Canyon in Los Alamos to the massive commercial Sutter Home vineyards. I don’t remember what he did that first day though he hasn’t stopped since a year and a half on – shoot thinning, sucker pruning, leafing, vine positioning, hanging wires, row by row, day after day. Harvest he says is the easiest time of year. The vineyard is machine picked and only the edges of each row are hand-harvested, which the company outsources with an alternate crew. He loves driving the tractor and organizing the machine shop. He is the only 68-year old white man on the crew and often enough brags about out working the rest of his colleagues, men half his age, explicitly exalting his Macedonian work ethic. This helped boost his ego when he and my mom recently vacationed in Key West and he was the fittest man at the pool. (Vanity may run in the family.) He hates when he doesn’t work half days on Saturdays and he gets post-harvest blues after the crew gets laid-off for the new year break. My dad’s work is precisely why I got 1.5 tons of Chardonnay in 2015, which is now Tati’s Frizzante Chardonnay on tap at Babi’s. I got a call one hot early September Tuesday afternoon asking if I wanted some Chardonnay grapes. “Tati, I don’t make Chardonnay.” He told me the company wanted a strict 23.5 brix with a 3.5 ph and this freshly harvested batch was miscalculated at only 23 brix. The company didn’t want it and they were going to have to dump it in the vineyard. “Such a shame. It’s free,” he whispered in the phone. I could hear the disappointment in his voice so I asked to speak to the ranch manager, who told me he could drive the fruit over if I had something to dump it into. Commercial harvesting equipment on this scale is completely different than the half ton picking bins the majority of smaller producers use. 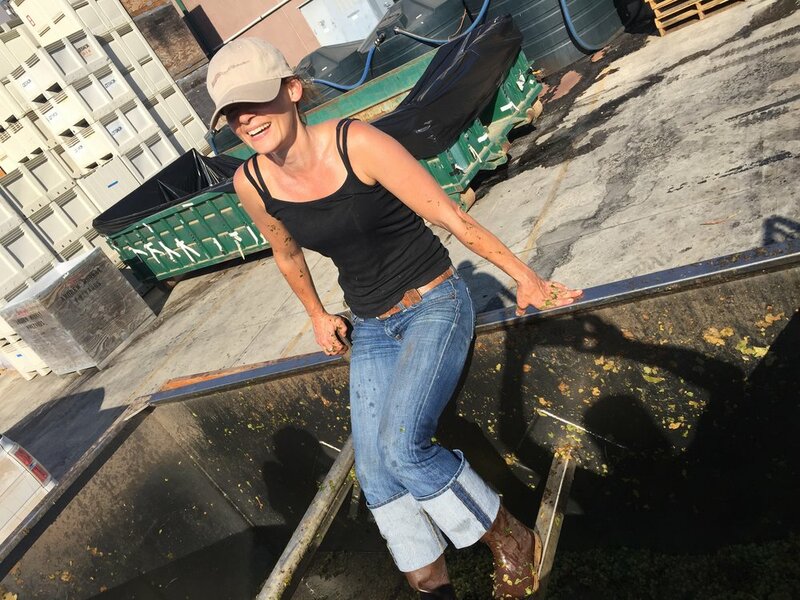 This gondola of Chardonnay arrived 30 minutes later on a flatbed truck and we proceeded to bucket out the grapes into bins I could navigate. I pressed the juice right away, let it cold settle in tank over night and the next day I took a sample for analysis. Brix: 23.5. Ph: 3.5. Last year in 2016 he kept asking me if I wanted to make more Chardonnay. “I will pick the best rows for you,” he kept saying. “Tati, I don’t make Chardonnay,” I kept telling him. He only half listens, like his daughter, waiting for a new entry to get his point across. Not to mention this large commercial vineyard has zero desire to navigate a small timer like me with 1.5 tons of anything. When there is a Macedonian will, there is a way. This year Sutter Home is replanting entire swaths of old vines that have decreased in production capacity and he asked if I had any need to plant a vineyard with all of the material they were discarding. “Such a shame,” he kept saying. During pruning preparation this past February he wanted to treat the crew to lunch, so my brother and I drove out to deliver. It was a bright glorious day as he drove up on the tractor with two of his companions. He introduced us, beaming from ear to ear. I understand his desire for camaraderie. We are social beings. Working with this crew outside in the fields brings him back to his childhood, the one he had to leave thinking he would return to. It brings him that feeling I had picking apples with my family. It brings him that accomplished, exhausted smile that I get after a good harvest day at the winery. It also brings him closer to understanding me, his first-born child, the one he always told could do anything she wanted. Tati’s Frizzante Chardonnay was only produced in kegs last September. It is light and refreshing. Growlers coming soon. Get it while supplies last on tap at Babi’s. Tati can often be found in the beer room reading the news on his phone late afternoons enjoying an IPA while sitting in the purple velvet theater seats. Be sure to say HI. Or Zdravo if you want to be cool.